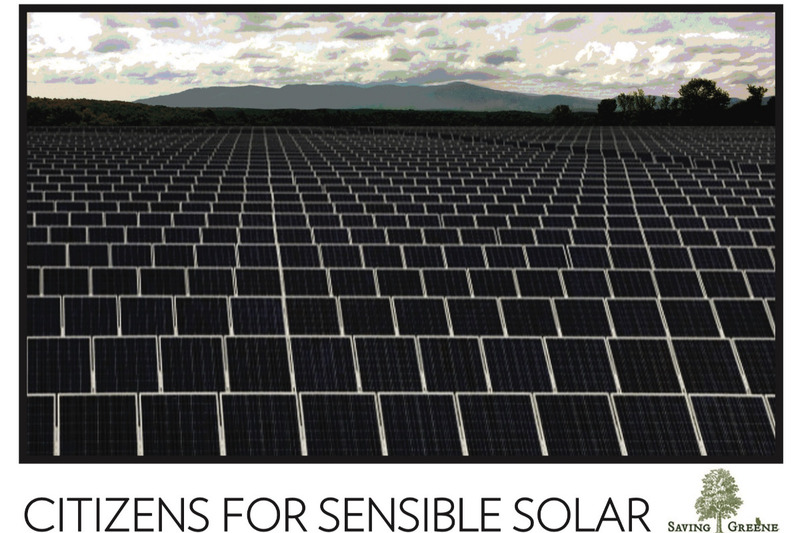 Saving Greene: Citizens for Sensible Solar is a Coxsackie-based advocacy group concerned about the responsible siting of these utility-scale solar plants. We advocate building such plants on brownfield land such as closed landfills and decommissioned coal and nuclear plants. We are not a NIMBY group. We oppose the reckless consumption of farms and residential land: we cannot continue to ruin green in the name of saving green, whether it's in our backyard or yours. Hecate Energy has proposed to site a 50-megawatt Greene County Solar Facility on 933 acres of residential and agricultural land in the town of Coxsackie, N.Y. The project would include up to 185,000 solar panels, along with inverters, substations, transmission lines, and miles of fencing. The utility-scale plant would occupy sites between NYS Routes 9W and 385. Unfortunately, this is prime farmland and within the habitat of threatened and endangered species. Much of our opposition to the proposed plant centers around the sheer scale of this facility. If built today, it would be the largest in the eastern US, and the plant is proposed for residential and districts with little or no natural buffering. The plant is being sited under Article 10 of the NYS Public Service Law, which takes control away from municipalities and local residents. What does this mean for us, for our community - That we have very little say in whether this project is completed, but have a major stake in the results. In addition to our legal fees, we've commissioned environmental impact studies to show the effect of Hecate Energy's proposed facility in Coxsackie. As such, we are seeking to raise partial funding to support the overall total costs associated with our group's effort to support responsible siting of utility-scale solar plants. For questions about the gofundme donations or about our organization, please email us at: savinggreene@gmail.com. Save the date September 12, 7:00p.m. Saving Greene public meeting. Thanks to all who have donated,its greatly appreciated. Check out Tesa Partridge's maps on Saving Greene's web site. It shows where all the solar panels are going. It's very telling.